So a funny thing I never realized before last Sunday — Sugata Mitra, the informal learning darling of the hour, was part of the NIIT team that did a leveraged buyout of the company I worked for in 2003. And NIIT still owns it. That’s interesting, since what Cognitive Arts does (or at least used to do) for NIIT would considered “Highly Invasive Education” to Mitra — well structured, scaffolded simulations focusing relentlessly on threshold concepts, designed by learning experts for hundred of thousands of dollars a pop. Apparently when you’re selling services to businesses that measure ROI, you don’t just give them a closet and a laptop and see what happens. But first, a bit of history: to keep the world’s military-industrial machine running at the zenith of the British Empire, Victorians assembled an education system to mass-produce workers with identical skills. Plucked from the classroom and plugged instantly into the system, citizens were churned through an educational factory engineered for maximum productivity. Like most things designed by the Victorians, it was a robust system. It worked. Schools, in a sense, manufactured generations of workers for an industrial age. But what got us here, won’t get us there. Schools today are the product of an expired age; standardized curricula, outdated pedagogy, and cookie cutter assessments are relics of an earlier time. Schools still operate as if all knowledge is contained in books, and as if the salient points in books must be stored in each human brain — to be used when needed. The political and financial powers controlling schools decide what these salient points are. Schools ensure their storage and retrieval. Students are rewarded for memorization, not imagination or resourcefulness. They made another machine to produce those people: the school. The schools would produce the people who would then become parts of the bureaucratic administrative machine. They must be identical to each other. They must know three things: They must have good handwriting, because the data is handwritten; they must be able to read; and they must be able to do multiplication, division, addition and subtraction in their head. They must be so identical that you could pick one up from New Zealand and ship them to Canada and he would be instantly functional. Mitra’s got a bad case of straw man disease here, but the most striking thing about his exposition is that he seems to believe our educational system was invented a specific time to solve a well-defined, identifiable problem: the production of clerical workers. And further, Mitra asserts that this need for Victorian clerks is in fact the reason the school exists as it does today. This is crazy. And I contend it’s crazy for you to listen to a man who thinks this way. First, a public institution is not an electric can opener. No one person sat down and said, hey let’s design an educational solution to Problem X from scratch. Second, public institutions are not static. Institutions evolve constantly based on the desires and needs of the communities they serve. There are reasons that education looks the way it does today. Real reasons. You may disagree with those reasons, but it makes no sense to say the reason is the system was designed for a particular need of a particular country 150 years ago. Take math. Even in the Victorian and Edwardian ages teaching rudimentary math represented much more than a single goal. 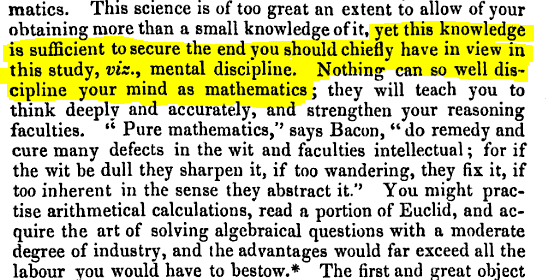 Many people argued for its utility in life, and certainly it was helpful in the sciences, but the most common explanation I’ve found in old textbooks is not Mitra’s mythical desire for better trained clerks, but the belief that doing math problems leads to greater mental capacity with other things in life that might matter to you. From Mental culture, published 1840. I’m not a math historian, but a quick scan through Google Books search will show you how this concept evolves. Famously, Thorndike and James execute their great transfer experiments at the turn of the century, and debunk the “mind as muscle” hypothesis. Eating math because it was good for you is no longer a valid reason. The patterns of practice in the modern school are similar for other phases of skill and subject teaching —lifelikeness and reality on the one hand, expansion and proliferation of the skills and subjects which are taught on the other, coupled with scientific knowledge of the problems involved. Arithmetic consciousness is built early in a youngster’s life, not by drilling him immediately on processes of addition and subtraction, but by acquainting him first with real situations in which addition and subtraction are used. This means that first-grade children will spend more time playing counting games, measuring the width and breadth of the room in which they live, estimating the sizes and differences in dimension of blocks and other objects, weighing themselves and recording gains in weight, measuring their height in inches and recording the difference in height between John and Alice—learning, in other words, to think in quantitative terms about the world around them. This means also that your son may not start formally to add columns of figures as soon as you did when you went to school. But by the time he reaches the third or fourth grade he will not only be doing as well as you did then (if he is as natively smart as you are), but he will also have a much sounder understanding of what adding and subtracting of figures is all about. Numerous experiments have shown that this is true. After World War II, this kind of progressivism came to be known as “life-­adjustment education” and became a major force in American education. Principals boasted that their programs adjusted students to the demands of real life, freeing them from dry academic studies. The new curriculums centered around vocation, leisure activities, health, personal concerns, and community problems. The schools in Des Moines, Iowa, for example, offered a course called “Developing an Effective Personality,” while junior high-school students in Tulsa learned what shade of nail polish to wear and how to improve their appearance. Some schools had no curriculum at all, while others pointed with pride to new courses in which projects or activities such as running a barbershop or decorating the girls’ washroom replaced traditional studies. A backlash forms against this approach, Sputnik goes up in the 1950s and suddenly it’s a more discipline-oriented focus, with gifted and talented programs to seek out the future engineers that will protect us from the Evil Empire and a grade school curriculum that puts students on a track for high school calculus. In the 60s and 70s the experimentation veers to what “open education” originally meant — student designed syllabi, classrooms without walls, decentered power structures, interest-based curricula. The Sudbury Schools and Summerhill become icons of the age. Math becomes a neglected subject. Then, in the late 70s, the U.S. starts facing global competition just as a backlash forms against anti-authoritarian culture, and bang — we enter the era of the international benchmarks and a college prep curriculum. Does this mean that every school became Summerhill in the 1960s? That Clinton-era testing wiped out all art programs? No. For every radical example to be found there were hundreds of schools for which the spirit of the age was more a shift in focus than a radical redesign. Most schools incorporated a mix of progressive and conservative ideas, and it was the mix that shifted over time. But far from being unresponsive to the ages the schools found themselves in, I think you could make an argument, ala Ravitch, that schools were actually hyper-responsive to the times they found themselves, often to the neglect of focused incremental improvement. Keep in mind that I am not the one that decided to argue this question on historical grounds: that was Mitra. He urges us to destroy a system that he has not made the slightest effort to understand. He sees math added at a particular time in educational history, makes some broad claims about why that might be, and associates the utility of math in the current curriculum with a series of decisions made by thousands of individual administrators nearly two centuries ago. He pays not a whit of attention to anything that has happened since. He ignores the fact that the ideas he proposes have actually been tried repeatedly throughout history, and instead embraces the techno-reductive claim that the affordances of new technology (not ideology) is driving the new possibilities he displays. The history Mitra narrates is this. There once was a race of Victorians. They built a can opener called education, and nobody has changed that can opener since, even though we no longer eat from cans. But we no longer eat from cans! Give me a million dollars, please. And they do! Words fail.